Brandon McNulty, one of America’s next great cyclists, has chosen to race in America instead of Europe. Why? 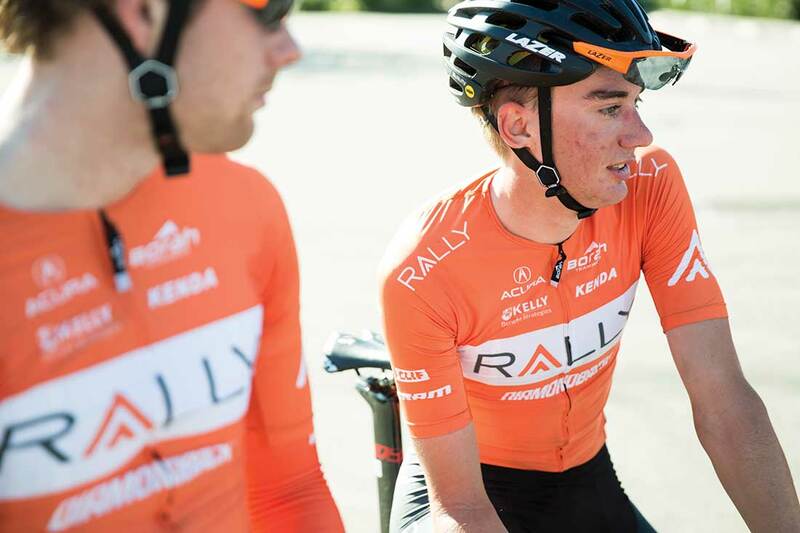 WHEN SEEN RIDING ALONGSIDE his Rally teammates, Brandon McNulty is indistinguishable from any other professional cyclist; he’s all legs and no upper body. In street clothes, however, McNulty transforms into a teenager with a child’s complexion. Like most kids, he spends his downtime playing video games and reading. Those who know him best describe him as quiet but sociable; he texted a thank-you message to his masseuse just hours after winning worlds. McNulty’s focus and talent were evident the moment his training wheels came off. When Brandon was eight, R.J. took him to a three-mile mountain bike trail that included a climb that was too steep for Brandon to ride. When R.J. recommended the two go home, Brandon threw a tantrum. A passionate mountain bike racer, R.J. McNulty says Brandon’s focus helped him overcome the boredom and discomfort that often chases kids away from cycling. So did his speed. Brandon started racing mountain bikes at age nine, and he took up road racing at age 11, riding in the local group rides alongside veteran racers. By the time Brandon had turned 13, R.J. says, Brandon could easily drop his dad. Brandon regularly finished on the podium at junior nationals, often near the country’s top junior, Adrien Costa, now with Axeon Hagens Berman. Cycling remained his hobby, not a career path. He never had a coach and instead relied on group rides for fitness. In 2014 McNulty met Knickman, who managed the California-based Lux/Specialized junior development team. Impressed by McNulty’s results, Knickman invited McNulty onto the team for 2015. At Lux’s 2015 training camp, Knickman had the juniors ride an eight-mile time trial course outside of Oxnard, California. After seeing McNulty’s power numbers, Knickman’s jaw dropped. Knickman put McNulty, who is six-feet tall and 150 pounds, in touch with longtime USA Cycling coach Barney King, who began training the youngster. Two months later, at Arizona’s Valley of the Sun road race, McNulty won the junior time trial, and his time would have put him into the top-10 in the pro division. Unlike the elites, McNulty had completed the race on a standard road bike with junior gearing. When King saw McNulty’s power files, his jaw dropped as well. He had averaged 380 watts during the 30-minute effort. King sent Brandon’s power files to Jim Miller, vice president of athletics for USA Cycling. Miller asked King if the power meter was broken. In McNulty, King sees the physical gifts for greatness. He squeezes his lanky frame into an aerodynamic time trial position, and approaches time trial courses with aggressive, time-shaving lines. McNulty climbs remarkably well for his height. And his pedaling cadence is abnormally high: 120 rpm. After just seven months of structured training and racing with Lux, McNulty headed to Europe to compete on USA Cycling’s junior national team. In August 2015 the squad took on the Czech Republic’s junior Peace Race, which has become an essential stop for up-and-coming talent. The American team came in with Costa as the unofficial leader. McNulty rode aggressively, winning the first stage and taking over leadership. Eventually, he won the overall. No American junior had won the race in its 44-year history. FOR TALENTED AMERICANS LIKE McNulty, the route to cycling’s highest echelon has always run through Europe. Greg LeMond famously signed with France’s Renault team at the age of 19; Motorola sent Lance Armstrong and other Americans to Europe in the early 1990s; van Garderen chose Rabobank’s espoir (under-23) development team over similar programs at home. USA Cycling still sends its U23 riders to the Low Countries every year, hoping the cutthroat development races pound them into seasoned professionals. The system produces few champions. But the list of washouts is long. The U23 riders participate in development races that are often better-organized than events in the United States. European U23 teams employ aggressive tactics, and the pace is a huge step up from the junior ranks. The weather is often dismal, and sickness can spread through a team quickly. The races weed out the less talented riders; others quit due to the time away from home. Sometimes, the system chases away riders with WorldTour-level talent. Chris Stockburger came to USA Cycling’s development house in Izegem, Belgium, in 2004, having won 11 junior national championships. He suffered through illness and overtraining, and results never came. At one point, he was quarantined due to illness away from the other riders for weeks. After another year of dismal results, he retired at the age of 20 to pursue medical school. A decade after Stockburger quit, his name still echoes within the minds of American development coaches as a cautionary tale. Did the program push him too hard? Could a kinder, gentler approach have helped him survive those crucial espoir years? Did super-talents like Stockburger even need to spend that much time racing overseas? King thought of Stockburger as he pondered McNulty’s future. He wondered if there was a better pathway to bring McNulty to the WorldTour. 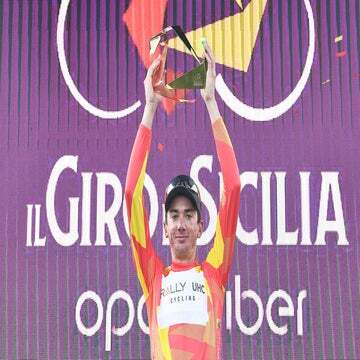 After McNulty’s Peace Race victory, WorldTour teams and rider agents began to query about the youngster’s next steps. Knickman had his own trepidations for sending McNulty overseas. A bronze medalist at the 1984 Olympics, Knickman turned professional at 19 with the French La Vie Claire team in 1986. He says team management promised to ease him into European racing. Instead, he was shipped from the Championship of Zurich straight to the Tour du Romandie and on to the Giro d’Italia. After four seasons in Europe, Knickman retreated to the U.S. domestic scene, where he retired in 2000. — college, a professional career — should cycling not work out. Perhaps throwing him into the European meat grinder wasn’t the best way to nurture his talent. 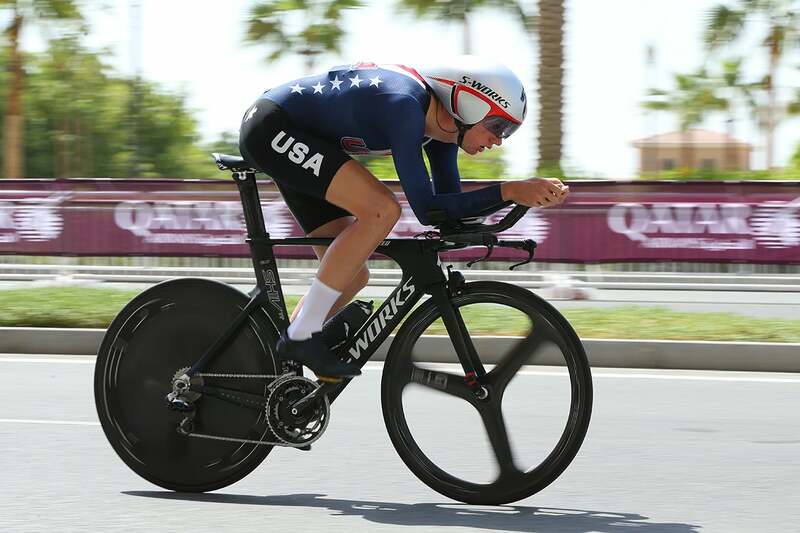 THREE WEEKS BEFORE THE 2016 UCI world championships in Doha, McNulty invited his USA Cycling teammates Ian Garrison and Tyler Stites to his house in Phoenix to train in the Arizona heat. Hoping to simulate Qatar’s hot, muggy conditions, the three took over the McNulty family garage, filling it with space heaters and wet towels. Three days a week, they pedaled 20-minute efforts on the trainers in the makeshift sauna. McNulty can’t say whether the unorthodox training helped him acclimate to Doha. While painful, the makeshift sauna intervals were fun. During race week, the heat rose above 100 degrees on most days. The day before his race, McNulty spun warm-up laps on the course. During these short efforts, he says, he knew his body was prepared. “I texted Barney and told him that tomorrow is going to be something special,” McNulty says. When all 83 junior riders had finished, McNulty had won by 35 seconds over Mikkel Bjerg of Denmark. Had McNulty been in the U23 race, he would have won the bronze medal. After McNulty’s victory, the inquiries poured in. Quick-Step’s U23 team Klein Constantia was interested, and so was Axel Merckx’s Axeon-Hagens Berman team. Two other European teams threw their names in the ring. A fifth inquiry came from Jonas Carney, director of Rally. A longtime friend of Knickman, Carney flew to Phoenix to meet with McNulty’s parents. 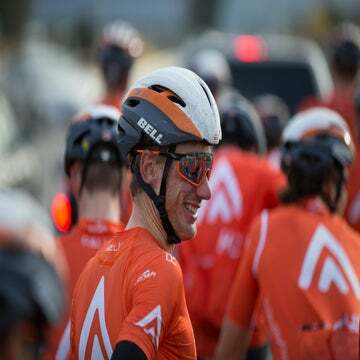 He said Brandon could do a shorter, two-month European stint with Rally, and then return to the United States to race domestically, before returning to Europe with USA Cycling in the late summer. He assured the McNulty family that his team’s veterans Danny Pate and Jesse Anthony would mentor the youngster. The deciding factor was schedule flexibility. King and McNulty viewed the 2017 UCI world time trial championships as their primary goal. When King asked team directors whether they’d guarantee schedule flexibility to prepare for worlds, only Carney agreed. McNulty’s American-centric plan is not without risks. WorldTour teams value results at small European races over those at top North American races. Racing dynamics in North America are less tactical and cutthroat than what you find on narrow, winding roads in the Low Countries. And the traditional European development plan has worked — even Stockburger agrees it’s still the best way to reach the sport’s pinnacle. Still, if McNulty can win another world title, the result will likely overcome any gap in his European experience. Thus far, Rally has agreed to work alongside King and McNulty’s goal. After several days of heavy training miles in January, the Rally team headed toward Southern California’s famed Gibraltar climb. King asked if McNulty could have a rest day, and the team agreed.